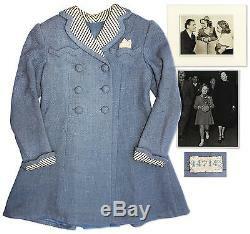 Shirley Temple beautiful screen worn coat from''Just Around the Corner'', a musical comedy film released in 1938. Costumer Gwen Wakeling chose blue boucle wool, made in a faux double-breasted style with self-covered buttons and rear pleating. Finely crafted coat features a blue silk lining and silk faille cuff and collar comprising cream and navy stripes. A tag within bears studio production number 14714. Temple appears in the coat early in the movie when she discovers she must live in a basement. Accompanied by a pair of vintage 8'' x 10'' photographs of Temple wearing the coat; posing in one with other stars of the film, and in the other she poses as Grand Marshall of the 1939 Tournament of Roses Parade. Measures 14'' x 29.5''. Some discoloration to inside of collar and a faint stain or fade at the bottom, else near fine. With a COA signed by the Shirley Temple estate. The item "Shirley Temple Worn Coat From Just Around the Corner" is in sale since Thursday, March 10, 2016. This item is in the category "Entertainment Memorabilia\Movie Memorabilia\Wardrobe\Originals". The seller is "n8sautographs" and is located in Los Angeles, California. This item can be shipped worldwide.